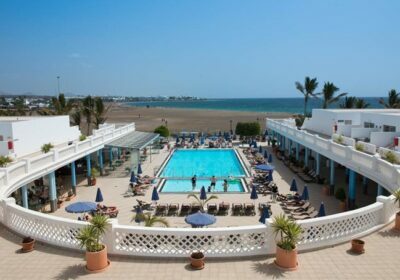 Las Costas Hotel Free Child Places Puerto del Carmen, Lanzarote. Las Costas is a popular choice for Family Holidays in Puerto del Carmen. The 4 star Las Costas Hotel is situated on the popular Los Pocillos beach. Bedrooms are spacious and very clean. Two swimming pools and an open air jacuzzi. With lots to do day and night. Food is delicious with a varied selection for breakfast and dinner served buffet style. Las Costas is situated on the beach of Playa de Los Pocillos only a few minutes from the resort centre with bars, restaurants, shops and an easy 1km walk into the centre of Puerto del Carmen for additional night-life. Las Costas has 187 rooms, 6 which are junior suites, and 4 are equipped for disabled access. All rooms come with a modern fully-equipped en suite bathroom, hairdryer, radio, satellite TV, a microwave, a sofa bed and air conditioning. For a local extra fee, a mini bar, safe deposit box, telephone and Internet access are available. The hotel facilities include a 24 hour reception, currency exchange, safety deposit box rental, WiFi and Internet access (local charge), laundry facilities (local charge), lift access and parking. There are also conference facilities, babysitting service and car rental available. There are two swimming pools – one for adults and one for children (both heated in winter), sun terrace with loungers, health and beauty centre, jacuzzi, sauna, fitness centre, games room, table tennis, billiards, children’s play area and animation programme.